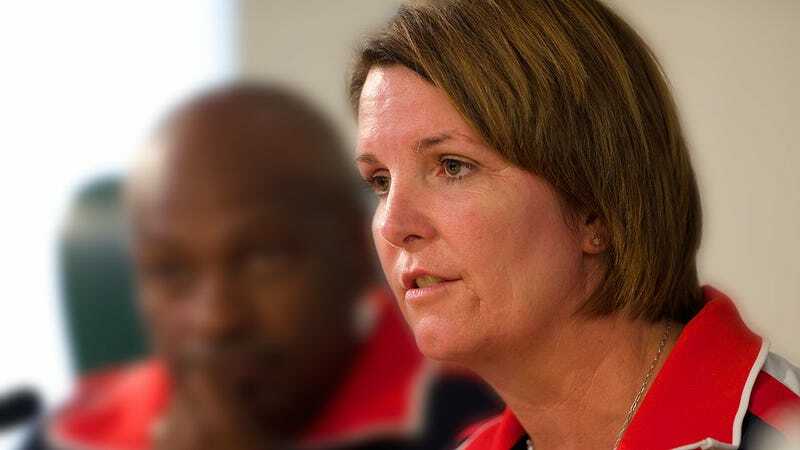 New Tennessee track coach Beth Alford-Sullivan cut six women from her team in September, just a month after proudly announcing her predecessor's entire recruiting class would arrive intact. Three of the cut athletes were scholarship freshmen who had just started the Fall semester at UT, according to the Knoxville News-Sentinel. Parents say the six athletes were summoned to Alford-Sullivan's office by text message Sept. 24 and, just two weeks into practices, informed they were no longer on the team. Parents say the coach bluntly informed the women she would not have recruited them, and told them they would not be a part of the team's vision moving forward. Steven White said he asked for an explanation when he drove to Knoxville to meet with Alford-Sullivan in her office on Sept. 26. "She never could give me that vision," he said. "Her statement was she didn't fit into the direction her and her staff are going in. She never told me what that direction was. She never told me the reason why she cut my daughter." The athletes were immediately banned from using Tennessee facilities and equipment, and face another year out of competition if they attempt to transfer to a different SEC school. NCAA track recruiting is different from that in major sports; the number of scholarships available is usually less than the number of scholarship athletes, so many of those athletes are forced to pay a percentage of the out-of-state tuition from their own pockets. These scholarship restrictions also make it extremely difficult for athletes in so-called "equivalency" sports like track to transfer mid-year without paying the full cost of tuition at their new school. While athletes regularly choose to depart a program upon a change in leadership, it's almost unheard of for them to be dismissed by a coach before even being given the opportunity to compete. Family members of the dismissed runners insist the women had no disciplinary or academic issues. This is the fundamental imbalance of power that lies within the NCAA's exploitative letter of intent contract system: coaches assume the reins of 17- or 18-year-old kids, who immediately concede all control of their educational, economic, and emotional futures for years to come.